I have a long relationship with Hewlett-Packard portable computing devices; my first experiences programming were on my father’s HP-65, and later the HP-41CV his employer loaned him for his daily work. I had a microcomputer shortly after encountering the HP-65, but learning keystroke programming greatly aided my understanding of assembly language — although I didn’t really recognize that until much later. I later graduated to an HP-28S and then an HP-48SX. In recent years, I have used various HP emulators on the portable devices I use for over ten years; I keep falling back to Free42, because it runs almost everywhere in one port or another. I’ve played with others, and i41CX is what I run on all my iOS devices. Much has been written about the fine craftsmanship and quality of these early devices — both their physical and electronic design, and the decisions made about their man-machine interfaces. I think exposure to this at an early age definitely has influenced my interest, desire, and recognition of fine design in modern computing products, especially mechanical interactions. I won’t add much here, except that though the bulk of my computation needs now are either so simple that I can do them in my head or on a slide rule (which, yes, I have one on my desk at work) or require real computation to set up, there is still a place for me to use a calculator. It is still faster for me to do some things with a calculator than add formulas to a sheet as I’m analyzing data; once I know what the data is telling me through this exploration, I can then put together the formulas and provide a reasonable presentation. 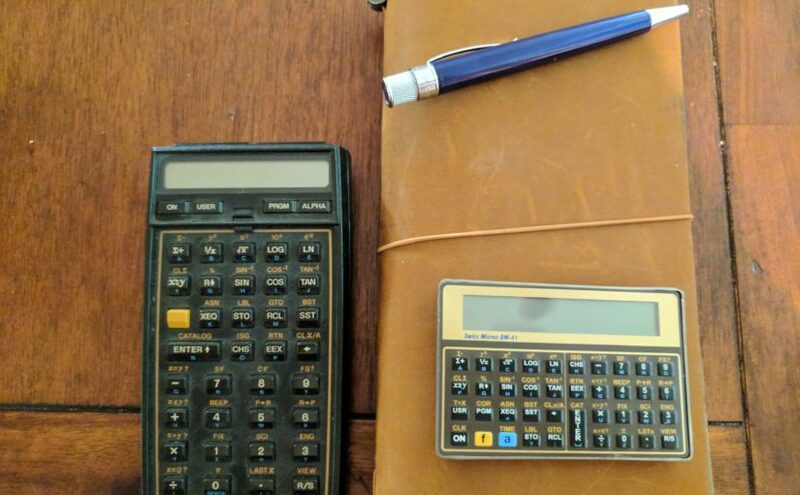 I think because of my upbringing and training, there is something about the cognitive process of using a physical calculator — much as there is in writing with pen and paper instead of typing, a subject much discussed elsewhere. I have just acquired a Swiss Micros DM41, their small replica of a HP-41CX calculator. It was a bit of an impulse purchase; I have a working HP-41CX I use occasionally, but don’t take it from the house because I am worried about breaking it or having it stolen (my first one was stolen, in 1988). But I had heard good things, and also wanted to support the effort overall — both by encouraging the good engineering of low-volume products for enthusiasts, and in the hopes that by supporting Michael Steinmann and his company that we’ll see other interesting things (the work on the DM42 is an excellent example of this). I won’t say much about the HP-41 series of devices, but instead provide links to hpmuseum.org and hp41.org. There remains an avid user community, and almost all of the original programs that were published in one way or another can be found on the internet. Many remain useful today. There is also a lot to reflect on when considering the culture of information sharing about calculators and calculation programs in the 1980’s and 1990’s, and blogs and enthusiast sites today about things like iOS and Android, or any programming language, especially the small, up-and-coming ones. More on that in a future blog post, perhaps. I would like, instead, to capture a few specific things about the DM-41 series (I will refer to both the DM41 and the DM41L as the DM41, because the features I’m discussing apply to both device) that are available from various forums and the Swiss Micros site, but necessarily in one place, both for future users and for future me. The DM41 is a faithful emulator of the original HP-41CX microcode, running on a low-power ARM processor, with a good mechanical keyboard and dot-matrix LCD display. Battery life and CPU speed is of course drastically better, although the memory remains the same (319 registers plus the stack, or just a touch over two hundred bytes), and at present there’s no way to mount external ROM modules, either as physical hardware or as memory dumps. The DM41 is keystroke-programmed in FOCAL using Reverse Polish Notation, which you either love or will never fully understand. (Contrariwise, it wasn’t until I was about thirty-five that I was able to use an infix calculator with any fluency for more than one operation at a time.) Because the calculator is actually an emulator running the original microcode, synthetic programming is supported. Craftsmanship is excellent — I would not say it is a replica that is identical to the original, but carries the same quality and respect for engineering. The display is good, the keys clicky and reliable (although on the DM41L, take a bit more pressure than on an HP product, but I am told that they break in), and the mechanical design sound. There are two variants of the DM41; the DM41L is in “credit card” format, which is the one I bought, and the other in the HP Voyager format. My only complaint, which is my fault, is that the smaller format is almost too small for my big fingers to use. Had I actually held a credit card and thought about it before ordering, this would not be a surprise, so I fault myself, not Swiss Micros. And having something this small means it’s very easy to carry. Because the physical layout is landscape instead of portrait, the keys are laid out differently; this is a bit of problem for my muscle memory, and my first hour with it recalled my “button paralysis” when I switched from the HP-41 to the HP-28, or the HP-28 to the HP-48, or later picked up Dad’s HP-42S to do something with him in his lab and couldn’t find anything. I have not confirmed this, but it seems that some of the alpha keys are mapped differently, too, or else I have forgotten the mappings for the special alpha characters. Unlike the HP-41CX, there is no shortcut sticker on the back of the DM41L, which is probably a good thing, because it would be very small. Second, here’s how to use the USB port to capture RAM dumps. The original HP-41 series had both card reader and HP-IL accessories for disk (then, “disc”) and tape storage; over the years this has been used to get software off of these devices in a variety of formats. The DM41 series has a miniUSB port, and connecting it to a computer — Mac, Windows, Linux, or even Android with USB-OTG — with the serial mode active gives you the ability to exchange full RAM dumps between the DM41 and the connected computer. Setting up a Mac, PC, or Linux is straightforward, and you can find instructions here. For Android, you can use DroidTerm and a USB-OTG cable. I had it running with my Macbook in about five minutes; most of the time was spent digging around for a USB-C to USB-A adapter. Once you connect the calculator and terminal (38400/N/8/1, please! ), and bring up the calculator in serial mode by pressing C (SQRT) and power, you should see the DM41 prompt in the terminal display. From here, you can enter ‘?’ to get help. Where things get interesting is the combination of software available on the web at sites like hp41.org and the programming tool Swiss Micros provides. In this web page, you can paste a well-formatted HP41 FOCAL program listing (no line numbers, though) in the right hand window, and press “encode”, and get a RAM dump you can transfer to the calculator. Even more interesting, you can also install programs you find over the internet that have been saved in the the .raw file format using the programming tool. (You can find .raw files in a lot of places on the Web; a good place for many of the applications that have been written over the years is the library at hp41.org, which only requires free registration). To transfer a .raw program to the calculator, download it to your PC, go to the programming tool, click “choose file” in the raw box, choose the file, and then “decode raw”. Copy the memory dump in the left hand window, go back to your terminal program connected to the DM41, and type ‘l’, and paste in the memory dump. Make sure the alphanumeric labels in the program are unique. Make sure you have enough memory for the combined programs. Concatenate all of the program listings (without line numbers) together in one listing in a text editor, with END statements between each program.. Copy the combined listing and paste it into the code box on the programming tool. Copy the resulting memory dump and load it into the calculator as usual with the ‘l’ command. I’ve done this to load the base conversion programs and the phase-of-the-moon program found on hpmuseum.org and the HP-41 User Solutions: Calendars collection. If you want to get a .raw file from a program you’ve written, it’s likely trickier; I’d start by getting a RAM dump, getting the listing from the programming tool, and then running it through something like the third-party HP User Code utility you can find floating around in a few places. I haven’t tried this, though. If you just want to get your program to another emulator, but you might have problems with the fact that most FOCAL listings include line numbers, and the listings provided by the programming tool do not. http://www.hpmuseum.org/prog/synth41.htm). A quick forum post (thanks grsbanks!) helped me understand that the dumps don’t show anything that’s all zeros. Edits 2017-06-24: Explained missing lines, removed registers not in the HP Nut CPU (I was conflating Nut and Saturn). Minor typo, link fixes.